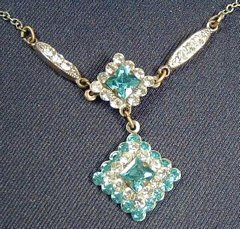 Exceptionally sweet piece combines white and aqua rhinestones in diamond shape formations. The double dangle pendant is set in-line and framed on each side by a rhinestone studded bar. Larger, center square stones are prong set. All other stones are paste set. Inside circumference of the necklace is 16". The pendant drop portion is 1 1/2". Chain looks to be a gold coating over a silver. Spring ring style closure clasp. No manufacturer markings. Most possibly Old Czech, circa the 30's. Stones are still sparkling brightly. Minor aging to metal but no damage. Spring ring closure functioning perfectly.